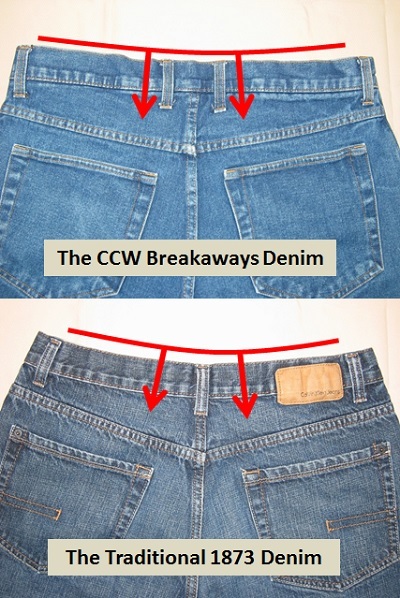 Why are there extra belt loops on the CCW Breakaways Jeans? What are the differences between the Traditional 1873 Jeans design and CCW Breakaways Jeans? The simple and concise answer is this . 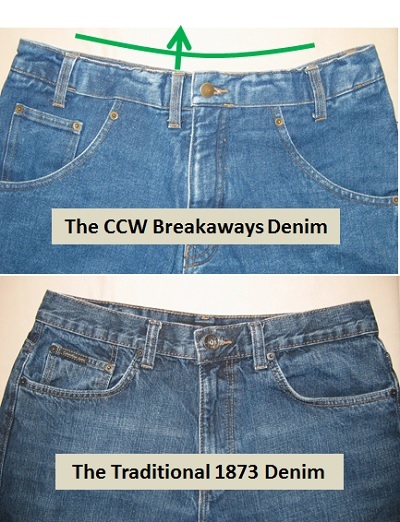 . . CCW Breakaways added two extra belt loops to prevent waistline sagging. One extra loop in the back. One extra loop in the front. Waistline sagging occurs in all pants and all brands (except ours) when stuff is put in the front or rear pockets. But we fixed that problem! So now for the lengthier and more detailed explanation. Let's start on the back side. Compare the two photos below. 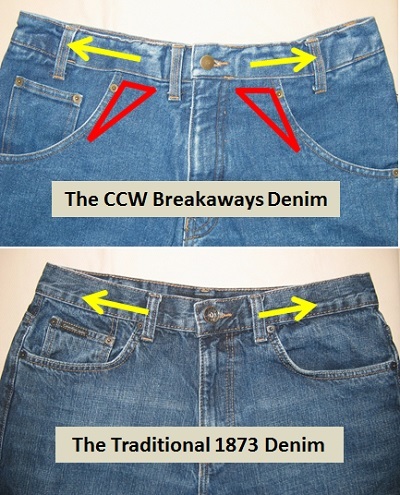 The Traditional Denim only has one loop at the center. The waistband sags on either side of the loop when stuff is placed in the pockets. This can be unsightly. We just added an extra loop to more evenly distribute the weighted load. Yes, it costs more but we think it's worth it. Now to the front side. Compare the two images below. They look pretty much the same . . . except for the one extra loop on the CCW Breakaways design. Thousands of these Jeans have been sold all over the world. Most folks never see the subtle differences in the two photos until we point them out. Look more closely at the next photos. We moved two of our belt loops outward (follow the yellow arrows). This allows our design to more evenly distribute the load around the entire waistband and secondly, it allows us to create an expandable "breakaways" opening for the fastest gun deployment possible from a concealed state (examine the two red triangles). OK, so why just one extra loop in the front, and not two balanced loops each side of the center button? The answer is simple. If two loops were used, you would never be able to put on and hitch a belt. There just wouldn't be enough room for the hitching process. Again, this extra loop costs more, but you have a better product in the end. Our goal is to provide "normal-looking" clothing . . . to provide deep concealment . . . with comfort . . . and be more tactically proficent than any other CCW method available. This is the fastest one-handed deployment for arm's length self-defense. Watch the video . . . and see the results!